A series of mini-storms have swept financial markets around the world this year. The Dow experienced two 1,000-point nosedives. Italy's bond market briefly blew up. China plunged into a bear market. The Argentine peso collapsed. So did the Turkish lira. Even beloved tech stocks have stopped going straight up. Facebook (FB) lost $119 billion in market value on July 26 -- the biggest one-day wipeout in history. After an unusually calm 2017, volatility is making a comeback. The turbulence appears to be a side effect of the Federal Reserve starting last fall to shrink its $4.5 trillion balance sheet. In a bid to revive the economy and stock market, the Fed took the unusual step in 2008 of aggressively buying government bonds and mortgage securities in an experimental program known as quantitative easing. 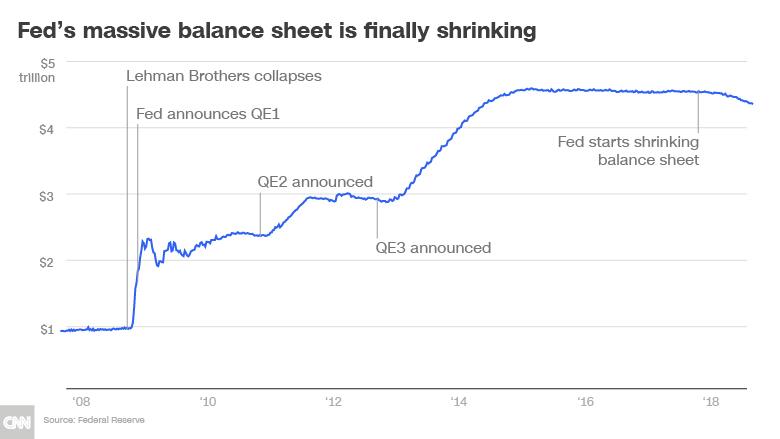 The central bank bought so much during QE1, QE2 and QE3 that its balance sheet swelled fivefold over a decade. The emergency actions -- extremely low rates and a massive balance sheet -- pumped global markets with liquidity. Risky assets like stocks surged. The Fed, emboldened by the strong economy, has begun to take the training wheels off. It's tightened financial policy by raising rock-bottom rates seven times since late 2015. Last fall, the Fed started to trim its balance sheet by $10 billion a month. The pace of selling has since accelerated and is on track to eventually reach $50 billion a month. "Quantitative easing was a big experiment, and so unwinding it is an experiment in and of itself," Kristina Hooper, Invesco's chief global market strategist, wrote to clients on Monday. The latest moves by the Fed, known as quantitative tightening, have been accompanied by increased market volatility. 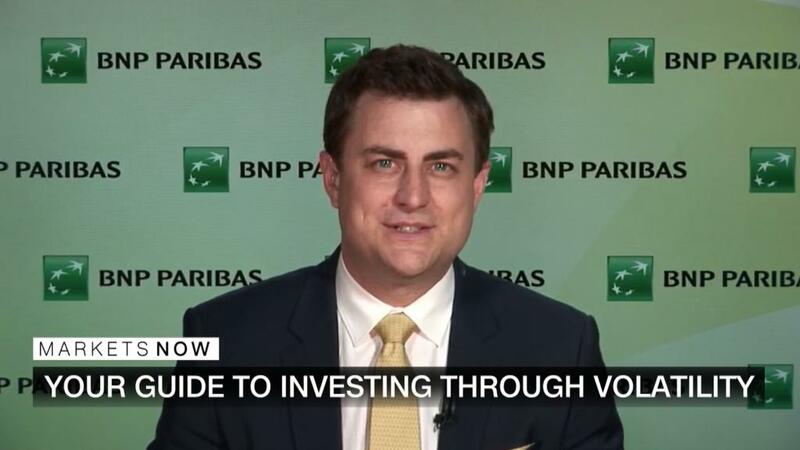 "It's no coincidence that accidents begin to pick-up the deeper you get into tightening," said Peter Boockvar, chief investment officer at Bleakley Advisory Group. "QE inflated markets to very high valuations. It's wishful thinking to believe QT isn't going to have an impact." While it's prudent policy given the strength of the economy, it can also have unintended consequences, such as the bursting of asset bubbles. "I expect more market volatility -- both at home and abroad -- as the experiment of balance sheet normalization continues," Hooper said. It's not just the Fed that has begun to unwind its emergency actions. In June, the Bank of England said it could begin shrinking its balance sheet sooner than previously thought. Even the European Central Bank plans to halt asset purchases by the end of 2018. Of course, the Fed's balance sheet is not the immediate cause of Facebook's blow-up. Investors rushed to dump Facebook shares after the social media giant warned of rising costs and slowing revenue growth. The heavy selling caused the Nasdaq to drop by more than 1% for three straight days. That hadn't happened since August 2015. The Facebook sell-off is a sign of the times. "Cult leadership becomes volatile & vulnerable as 'liquidity' [is] drained," Bank of America chief investment strategist Michael Hartnett wrote to clients on Friday. He called the Facebook "shock" a "classic 'late-cycle' event." Emerging markets have faced the brunt of the storm. The Fed's rate hikes have strengthened the dollar, making it harder for countries to repay money they borrowed in US dollars. Investors are also yanking money out of emerging markets. Argentina's currency crashed to a record low earlier this year, forcing it to reach a $50 billion bailout with the IMF. The Turkish lira has plunged 30% against the dollar, raising fears of another emerging market crisis. Last month, Irjit Patel, the governor of the Reserve Bank of India, pleaded with the Fed to slow plans to shrink its balance sheet. If the Fed doesn't shift course, "a crisis in the rest of the dollar bond markets is inevitable," he wrote in an op-ed in the Financial Times. The good news is that many emerging market countries are in far better shape than a decade ago. They're built up reserves to deal with market turbulence. "We don't see vulnerabilities on a broad basis in emerging markets," said Barbara Reinhard, head of asset allocation at Voya Investment Management. The return of market storms doesn't mean the Fed is on the wrong track. It only seems wise to wean the economy and markets off crisis-era policies. "The Fed should be taking away emergency stimulus. If it doesn't, it'll blow an asset bubble like what we saw in the housing bust," said Reinhard. And so far, the Fed has pulled it off without disrupting the economy. It's a sensible strategy, even if it brings about a bumpier ride for investors.